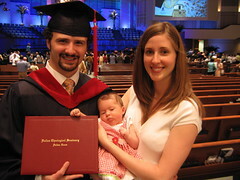 Saturday, I “graduated” from Dallas Theological Seminary. These ceremonies are called “commencements” because the graduates are finished with their studies and are beginning something new. In my case, however, “commencement” means beginning summer school! I have four classes to pass this summer (and the final draft of my thesis) before I really “commence” anything. What a fun day! The ceremony took place at Prestonwood Baptist Church–a beautiful place. It was wonderful to celebrate with friends and family the beginning of the end of a lot of hard work-not only for the graduates, but particularly for spouses who worked incredibly hard to put us through. Thanks, Diedra. You worked so hard. You’re amazing! Thanks to the faculty for discipling me. Thanks to friends and family members who supported us with prayers, finances, and material goods along the way. God provided through you. Thanks also to Dad and Mom for making the trip. And thanks to everyone who sent their congratulations through cards and gifts. You’re too kind. We don’t currently have any definite plans. Lord willing, I’ll finish up in August. We’ve signed our lease through November. I’ll work fulltime at Baylor and send out some resumes. We’ll watch, talk, and pray. 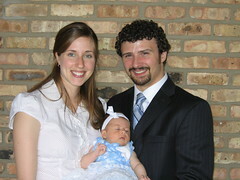 We dedicated Miranda on Mother's Day. It was so nice that Dan's parents could be here. The pastor gave a precise explanation of what a baby dedication actually means to the child, the parents, and the community of faith. (Good thing we got it on tape because it is kind of like our wedding day, mostly a blur full of smiles.) He said that a dedication is by no means a work of salvation, but for the child means they will grow up in the community of faith where they will hear the Story and hopefully respond in faith by the gracious work of the Holy Spirit. 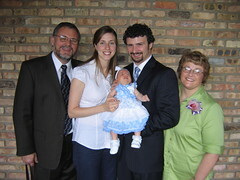 For the parents it means that we recognize that the Sovereign God is Lord of all creation (including our daughter) and that we humbly submit by confessing that the Lord may do with her life what He wills to do for the glory of His Name. For the community of faith it means that our brothers and sisters will help us to bring up this child in the training and instruction of the Lord. 1. 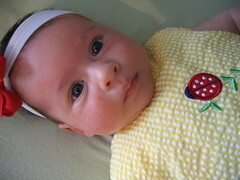 Do you believe the Father created your child in body and soul? 2. Do you believe all the days of your child are in the Father's hand? 3. Do you promise to raise your child in the instruction of the Lord on the basis of the Holy Scriptures? Only by the grace of God working in our lives can we possibly believe and promise these things. Lord, help us, by the power of your Spirit, for we are sinners! It was a day of thankful rejoicing, mingled with memories of pain, and grief for those who are grieving. A Very Happy Mother's Day! We are so thankful for Andie. Dan kept saying how at this time last year we wondered if this day would ever come. We are aware of the ache Mother's Day can bring for many, not just those struggling with infertility. Some mothers have lost children through death or estrangement. Husbands are grieving the loss of the mother of their children. Sons and daughters wish their mom was still with them or wish they would have had a mother who didn't abandon them or abuse them. We were blessed by a pastor who did not shy away from the pain and filled all of our hearts with comforting words on this Sunday mixed with mourning and rejoicing. 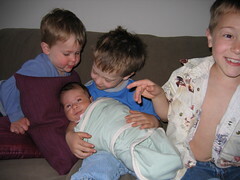 Here are Miranda's cousins Owen, Evan, and Logan (left to right) admiring her for the first time. They made the trip all the way from Indiana. They thought she was pretty cute and gave her lots of kisses. They call her "Baby Miranda".